Alternatively, you can call the hotel at 1-800-228-9290. Our discount code is SU Tipon 2019. Each standard room costs $119 (pus taxes) for single or double occupancy or $139 (plus taxes) for triple or quadruple occupancy. If you come a day early,. (e.g. July 31, 2019) or want to stay an extra day (e.g. Aug. 5 or 6), we have a couple of rooms that can be booked at the same rates. Please let your chapter members and other Sillimanians know by forwarding this email to them. I urge you to book you room as soon as possible since we expect a large of number of alumni to attend. Of course, we can ask for more rooms but there is no guarantee that there will be available rooms for the same rates. 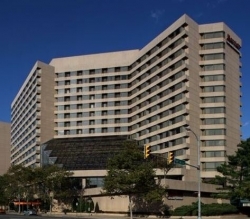 Our Tipon hotel is the Crystal Gateway Marriott, 1700 Jefferson Davis Highway, Arlington, VA 22203.